The aim is to surgically obtain a beautification of the face by modifying one or more aspects that displease aesthetically the patient, while maintaining a natural and credible aspect with respect to its morphology. The desired shape is determined jointly by the patient and the surgeon by the analysis of photographic plates making it possible to define the best compromise. Plastic surgery of the nose (rhinoplasty) is the corrective surgery of the deformations of the nose. Its purpose is to correct the deformations of the nose and to improve its aesthetic appearance. It is sometimes associated with a gesture on the nasal septum when it is deflected and causes discomfort to breathing. This is called septorhinoplasty. An external postoperative restraint is set up at the end of the procedure. It is provided by self-adhesive dressings (steri-strips) which have the function of reapply skin and muscles on the new nasal skeleton. This first restraint is often reinforced by a plaster or resin splint which keeps the nasal skeleton in its new position during the first time of consolidation and scarring. This restraint will be maintained for several days, usually 7 to 10 days depending on the context. The average duration of the intervention is 45 to 90 minutes depending on the difficulties of the operation, the operation is done under general or local anesthesia. Depending on the type of anesthesia, the procedure requires a 2-4 day trip..
Otoplasty is a surgical procedure aimed at correcting abnormalities in the cartilage of the ear, which is responsible for the “peeled” appearance sometimes present. The purpose of the operation is to achieve real symmetry of the ears while giving them a natural appearance. Otoplasty can be practiced in adults or adolescents, but most of the time correction is considered in childhood, where it can be practiced from the age of 7 (usually the age to which l The child begins to complain of his appearance and suffers). In practice, the cutaneous incisions, the first stage of the operation, are performed only in the retro-auricular groove, ie in the natural fold behind the ear. Depending on the case, small additional incisions are made on the anterior surface of the pavilion: they are concealed in natural folds. The second step of the intervention is cartilage action. Several gestures are feasible, such as striations, incisions, resections, or fixation by sutures … The determination of these gestures essentially depends on the anomalies to be corrected. The decision is taken during the preoperative consultation. For sutures, if the practitioner uses nonabsorbable points, it is to withdraw on the 10th postoperative day. Finally, as a final step, an elastic dressing around the head is placed in order to keep the ears in good position. The procedure can last from 45 minutes to 1h30, is done under general or local anesthesia. Depending on the type of anesthesia, the duration of the stay may vary between 2-4 days. 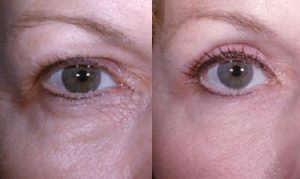 Over time, our eyelids undergo unwanted changes, making the look more tired or more aged. Many factors, such as heredity or sun damage, can accelerate these changes. A tired look or puffy eyes can also result from the presence of greasy pockets in the inner part of the upper eyelids or under the lower eyelids. These excess skin and fat can be removed surgically by a procedure called blepharoplasty. Blepharoplasty has seen great progress in recent years. The procedure lasts 45 to 60 minutes and consists of spreading the skin by removing a spindle of skin on the furrow over the eye and extracting the small greasy pelotons that have been lodged there. The goal is to find the juvenile form of the eye. The scar, where it is placed, will be rigorously invisible. The operation can be performed under local anesthesia or, for anxiety, under neuroleptics. This intervention is indicated in the case of the presence of the bags under the eyes, giving a tired look, and can attenuate some fine lines. The procedure is the same as for the upper eyelids: an incision is made at the level of the lower eyelashes, always very fine. The existing cysts of fat are then removed, as well as the removal of excess skin. Hemostasis is then practiced. Suture, always at the level of the lashes, where the very fine incision was made. The average duration of the operation is 60 to 90 minutes depending on the operating difficulties, the operation is performed under local or general anesthesia, on request. Depending on the type of anesthesia, the procedure requires a 2-4 day trip.